Great Home for a starter or move-up family! Absolutely stunning custom-built 2 storey home located in Genesis on the Lakes, Stony Plain. Open concept kitchen with central prep and eating bar + nook, complete with upgraded solid-wood and soft close cabinets, and walk thru pantry with storage. Spacious living room with gas fireplace and custom mantle. Great home for a starter or move-up family! 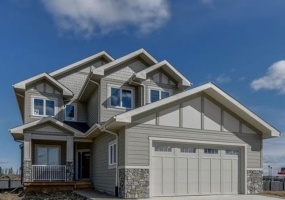 Absolutely stunning custom-built 2 storey home located in Genesis on the Lakes, Stony Plain. Open concept kitchen with central prep and eating bar + nook, complete with upgraded solid-wood and soft close cabinets, and walk thru pantry with storage. Spacious living room with gas flreplace and custom mantle. Gorgeous dining room or office with wall.